Dr. Rebecca Orr, one of the presenters at the workshop, taught participants on team-based learning skills. 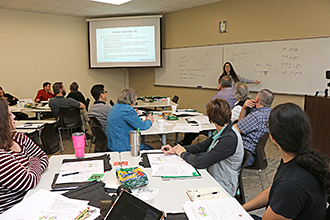 Paris Junior College recently hosted a workshop with Howard Hughes Medical Institute (HHMI) BioInteractive to assist instructors on using their free teaching resources to promote student-centered, active learning. The workshop targeted college and university instructors teaching introductory courses in biology, cell/molecular biology, and genetics. Attending the workshop were thirty instructors from Texas A&M University - Commerce, Panola College, Tyler Junior College, University of Texas at Tyler, Collin College, Northeast Texas Community College, Texarkana College, Grayson College, Dallas County Community College District, and PJC.